John’s discovery of social blues dancing in 2009 harmonized with his love of blues music and pushed him into rigorous study of blues dancing all over the country, accompanied by careful, dedicated instruction from top international blues instructors. Since 2011, John has been teaching both locally and nationally. His vast experience of several decades’ worth of dancing to just about everything gives him a breadth of knowledge and flexibility to meet the needs of students of all backgrounds. 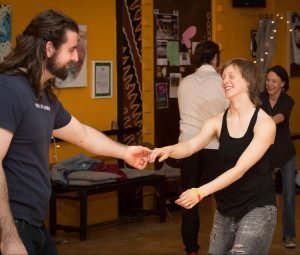 John runs a fun, lighthearted classroom, and enjoys working with beginner dancers, instructors, and everyone in between. He believes it is important to not only hear the music, but also understand the roots of what you are listening to in order to fully appreciate the dance. His classes will challenge you to strengthen your musicality, your body awareness, your quality of movement, and most importantly, push you to express the music authentically. When John isn’t running the local blues scene in his hometown of Albuquerque, New Mexico, he travels around the country competing, learning, and teaching. John currently runs the Blues dance scene in Albuquerque, New Mexico, and is proud to have the opportunity to build this community. He’s got a great team to help run things and spread the love of Blues dancing around the state of New Mexico. Our team can be found at the local weekly Blues dance in Albuquerque, various live music venues around town, other local dances (Swing, Salsa, Tango), and even other dance events around the country. In addition to DJ’ing Blues music locally, John has also DJ’d R&B, Soul, and Blues at several Fusion Exchange dance events (Boston Fusion Exchange, San Francisco Fusion Exchange, Las Vegas Fusion Exchange, Denver Fusion Exchange), Atomic Blues Fusion, Rain City Blues and various other events. 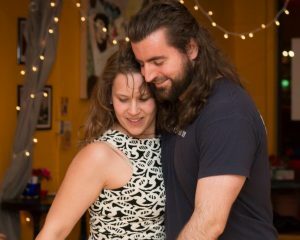 John is proud and eager to share his joy and passion of Blues dancing with this wonderful community, whether it is through teaching, DJ’ing, or organizing events. Update: As of 2016, John is now an All Star! Finals – Solo Cuttin’ Chicago bluesShout! Finals – Open Jack and Jill Chicago bluesSHOUT! Finals – Novice Jack and Jill Minnesota bluesSHOUT! Finals – Novice Jack and Jill Boston bluesSHOUT! A life-long social dancer, Miles loves to dance with new people, learn new forms, and explore the cultural and historical contexts of social dances. Miles was introduced to blues in 2014 in the wee hours of the morning at a secret dance party in a locked theatre. Despite a wildly inaccurate and vague first lesson (bend your knees, attach them to your partner’s knees, and go), it was too much fun not to explore the form further. Since then, Miles has been curiously diving into the movement aesthetic, partnering mechanics, and cultural context of blues dance, training primarily with John Vigil in Albuquerque, New Mexico. Outside of social dance, Miles has been teaching dance classes in a variety of settings since 2011, holds a liberal arts degree focused in dance, dance education, and functional anatomy, and takes every opportunity to learn more about teaching movement. Currently, Miles teaches contemporary dance, creative movement, and improvisation to people of all ages and all abilities. Miles’s classes draw on somatic, anatomical, improvisational, and empowerment-oriented practices to support body awareness, spark creativity, and encourage intentional choice-making. 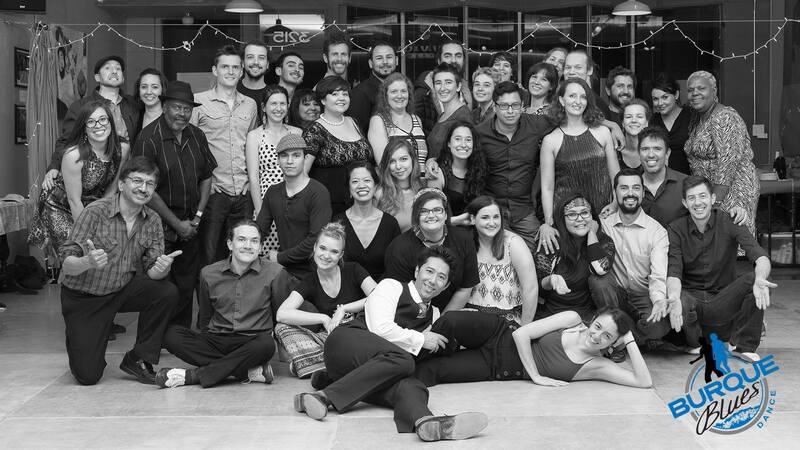 Miles believes that social dancing is, at its essence, an opportunity to build inclusive community. Sean was never interested in dancing until he attended one of John’s blues dance lessons in 2012. Much to his surprise, Sean grew to appreciate the relaxed and grounded nature of the blues aesthetic, as well as John’s focus on expressing musicality and asymmetry rather than movement patterns and footsteps. Sean ended up attending John’s weekly group classes for over a year and continues to improve his blues dancing via private lessons and workshops. Sean has also DJ’ed regularly at Friday Burque Blues since early 2016, and just recently started co-instructing Friday’s group lesson with Miles. Sean still has much to learn, and looks forward to continuing his development as a dancer, DJ, and instructor. Sean graduated UNM in 2014 with a BBA/Finance. In addition to being a dancer, Sean is also a powerlifter and strength coach, rock climber, cyclist, yogi, and all around good guy. Blues appeals to a wide variety of ages and audiences! We have people from all walks of life who share one major thing in common – a LOVE for blues music and dancing!! There is no “too old” or “too young”or “two left feet” in blues dance! We come together for the love of movement and music! Join our newsletter and stay up to date on all the Burque Blues dance goodness and other related activities in New Mexico. You may also receive emails with special discounts or contests! Our monthly lesson and dance will vary, stay in touch on FB and/or our newsletter!